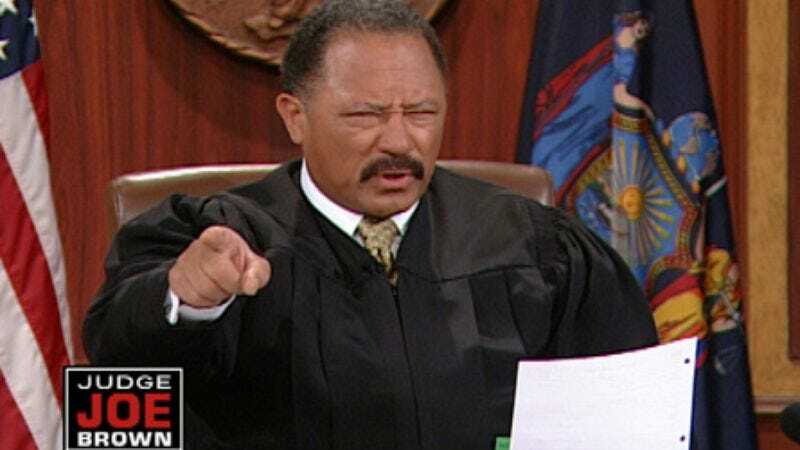 Leaving a nation teetering on the brink of lawlessness, its womanhood unprotected and manhood un-promoted, CBS has canceled the long-running Judge Joe Brown, the syndicated courtroom show that for 15 years has been the thin brown line standing between order and chaos, crankily telling chaos to shut its mouth while order is talking. The Hollywood Reporter says CBS opted to end the series after a prolonged salary negotiation, which saw the judge who frequently tells his litigants to have some self-control demanding a raise on his $20 million-a-year salary, even as his ratings continued to decline. But exhortations for CBS to “man up” and give him more money fell on deaf ears, apparently, and the show will end its run this September. And after Brown departs the TV bench, there shall be utter anarchy, feebly addressed by such lesser, unmanly sham courts as Judge Judy, The People’s Court, Judge Alex, Judge Mathis, the Supreme Court, etc.